Today we have Michelle George from Quakertown, PA (near Philadelphia) with us, to talk about being a vegetarian. Simply my love of animals. There is a slaughterhouse a couple towns over from me and the trucks carrying the pigs and cows would often pass me on my way to work. It got very hard for me to make the disconnect between the meat on my plate and the animals that provide that. Once I couldn’t make the disconnect, I couldn’t stomach eating meat. A little over two years. I made the jump in May 2012. I haven’t looked back since! What was your biggest challenge in becoming a vegetarian? Cheesesteaks! I live near Philadelphia and there is no shortage of good cheesesteak places. I actually dreamed about eating meat for about a year after I went veg. Seriously, the biggest challenge is when I eat at restaurants or work functions. It’s a meat eater’s world and some restaurants are not veg friendly. Going out to eat requires planning and research. The last thing you want is to be stuck eating all the deep fried stuff on the appetizer menu. That said, more and more restaurants are getting a clue and have some vegetarian options. I am especially impressed when they have a vegan option. My wish is that every restaurant have a veggie burger on the menu. Does being a vegetarian go beyond the plate for you? Absolutely! My love of animals inspired me to not only stop eating them, but also stop using products tested on them. I only use cruelty-free makeup and bath products. I am close to being 100% cruelty-free in my cleaning products. I am toying with making my own bath and cleaning products now. Do it little by little. Learn some vegetarian recipes and try having a couple meat-free days every week. Learn proper nutrition to make sure you are getting all the things you need to stay healthy. There are so many resources on the web to help with this. Also, if you have trouble making the jump to a meat-free life, keep trying. I started trying when I was 16, but it took many, many years to be a full-on vegetarian. Do you have any meat eaters at home? If yes, how do you handle meals? I did – my husband went vegetarian a year after I did. He was incredibly understanding and he ate vegetarian meals most nights when I cooked. I would make him meat a couple times a week, but eventually he started eating veg lunches at work. He made the jump last year and we are 100% vegetarian now. Basil and garlic. I also love a good cracked black pepper. My veggie chopper! I got it from QVC and it makes chopping vegetables quick and simple. The best $20 I’ve ever spent (well, my husband ever spent…he bought it for me for Christmas. How sweet!). It takes considerably less time and effort to cook with fresh food, which is especially nice when I am making soup or veggie chili. It also makes it easy to throw a ton of vegetables into my homemade spaghetti sauce. Morning Star Farms Grillers Crumbles. I make sloppy joes with it, you can throw it in pasta sauce….almost everything that normally calls for ground meat. 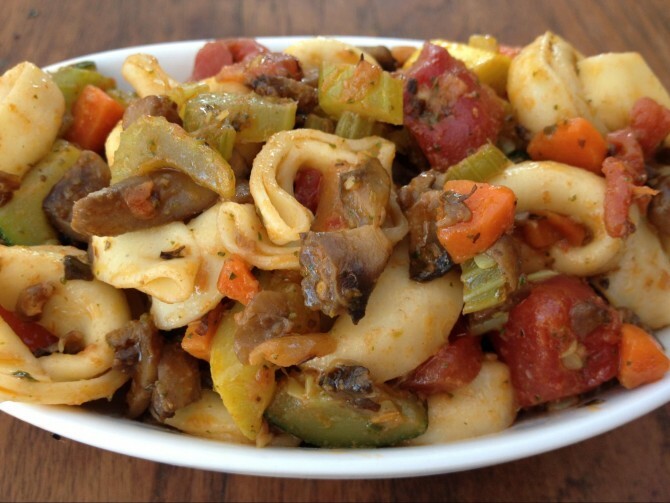 Veggies and tortellini. I start with sauteed fresh veggies…any kind you want, but I always throw yellow squash and zucchini in. I sometimes add celery, mushrooms, sliced tomato, and asparagus – whatever I have in the refrigerator. Cook all the crunchy veggies in olive oil with garlic and black pepper. Be generous with the garlic! Boil some cheese tortellini and throw it in the pan along with the softer veggies (tomatoes, mushrooms, etc). Then add some canned/jarred artichoke hearts. Sprinkle grated Parmesan cheese to taste. When everything is nicely combined and the crunchy veggies are a bit soft, then it’s ready to serve. Recently, I have been adding Quorn “chicken” tenders – they are chunks of veggie “chicken” that bulk up the dish and add some protein to the meal. I tried this pasta and my family loved it. Was great to use up all the leftover veggies to make something delicious. Thanks Michelle for sharing your story!